Poached eggs are one of those wonderful and mysterious foods that both delight and intimidate me. I’ll be the first to order anything with a poached egg at a restaurant, but making them at home seem impossible. 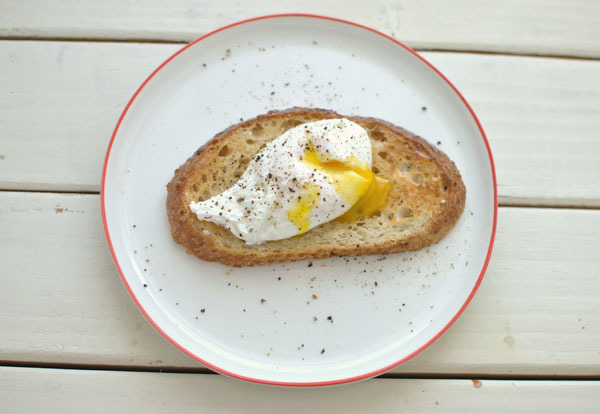 Bon Appetit’s recipe for poached eggs, which promise “a lava-like flow of the yolk,” convinced me to try it. Surprisingly, it worked (and was pretty easy, too)! 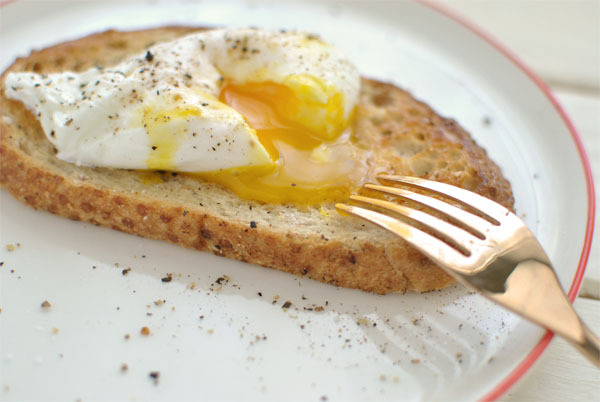 The whites were firm and tender, while the golden liquid yolks spilled out like a dream over buttery toast. How do you like your eggs? Would you try this at home? Pour 1/2 cup vinegar into each of 2 small bowls. Crack 1 egg into each bowl, taking care not to break yolk; let stand for 5 minutes. Meanwhile, bring a medium saucepan of water to a boil over medium-high heat. Using a whisk, vigorously swirl water until a vortex forms in the center. Slip 1 egg with vinegar into vortex and continue to swirl water with whisk around edges of pan until it returns to a boil. The egg white should wrap tightly around the yolk, forming an oval shape. As soon as water returns to a boil, reduce heat to medium and gently simmer egg, frequently swirling water, for 2 minutes. Using a slotted spoon, lift egg from water and use kitchen shears to trim any stray pieces of egg white. Place egg on paper towels and gently blot; transfer egg to a bowl or plate. Repeat with remaining egg. (If poaching more than 2 eggs, repeat using fresh water.) Season with salt and pepper. DO AHEAD: Can be made 1 day ahead. Immediately transfer to a bowl of ice water and let cool. Using a slotted spoon, transfer to a plate. Cover; chill. Rewarm in a saucepan of simmering water for 1 minute. Looks yummy! I love poached eggs.